A while ago I was invited to inspect a commercial kitchen duct at Currumbin here on the Gold Coast. 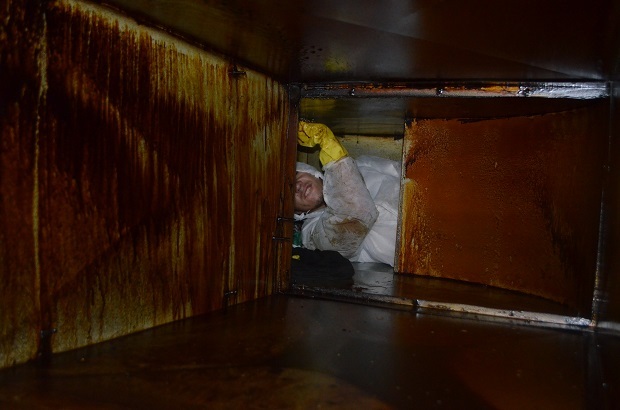 And even today after ten years of duct cleaning experience, it makes me smile to know that I can still be pleasantly surprised by the lack of work ethics displayed by other commercial hood and canopy cleaning companies. Most of our Professional duct work involves climbing into very small tight holes, this one at Currumbin Gold Coast was in fact a bit of a leisurely stroll for the lad as he had lots of room to move. How to we Start?? By simply a systematic approach . Start at one end and work your way though. 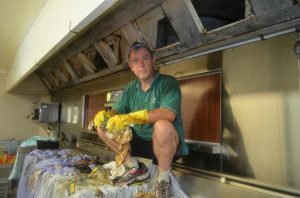 Most canopies take two to three hours to remove all the residual grease. Its is surprising just how quickly we can do the work. Most of me reliable staff have been with me for over five years now. It can be sometimes overwhelming when we start, a little music never hurts. 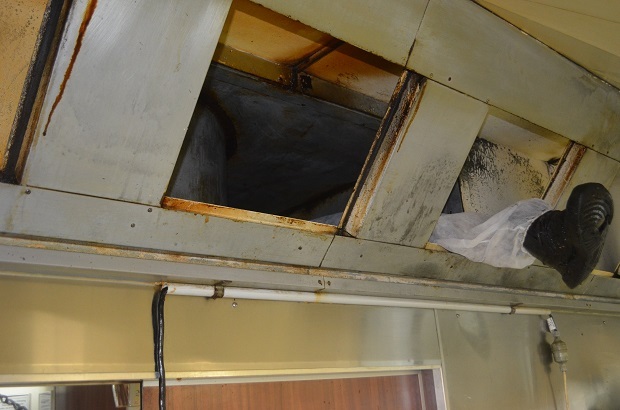 Many commercial kitchen canopies have layers of ducting high above eye level. To the untrained you would never know it was there. 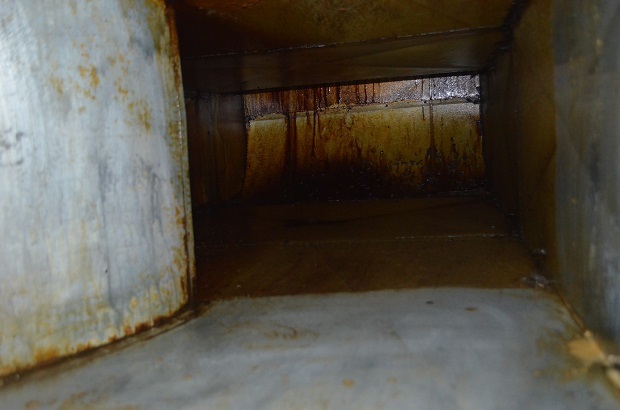 I regularly find many void areas that are just left uncleaned. Not because they cant be reach, more so the contractors just can be bothered. We simply work our way up cleaning as we go. Generally most holes can be breached, fortunately many of my staff are of slight build so can get into many tight areas. Many new restaurant customers tell me that they are currently happy with the present work that they are receiving until I take a look inside and show them the areas that they don’t see. Sadly many contractors only clean the areas that you can see and leave the rest. what they leave is great amount of residual grease that once accumulated amounts to a fire hazard.